The year was 1918. The place, Camp Dodge in Des Moines, Iowa. Eighteen thousand soldiers gathered on an open field with one purpose…to use their bodies to form an image of the Statue of Liberty. Like the pointillism painting style or pixels in a digital camera, the men together make up pieces of the image with their location and clothing color. With Col. William Newman commanding and Col. Rush S. Wells directing, the men collaborated to form an enduring image of Ms. Liberty. It’s no small effort to create an image so large. As the group stretches farther away, the perspective changes and more men are needed to complete the image. Photographers Arthur Mole & John Thomas of Chicago created the image and many others. 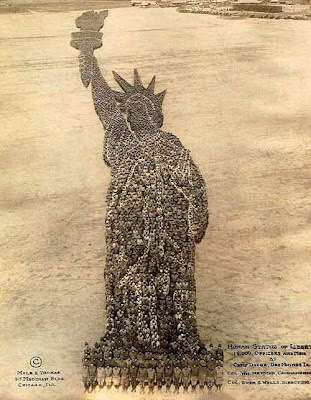 The Lady Liberty photograph was part of a promotional campaign to sell war bonds during World War I.